My easiest vegan wing recipe yet: Vegan Salt and Pepper Wings! 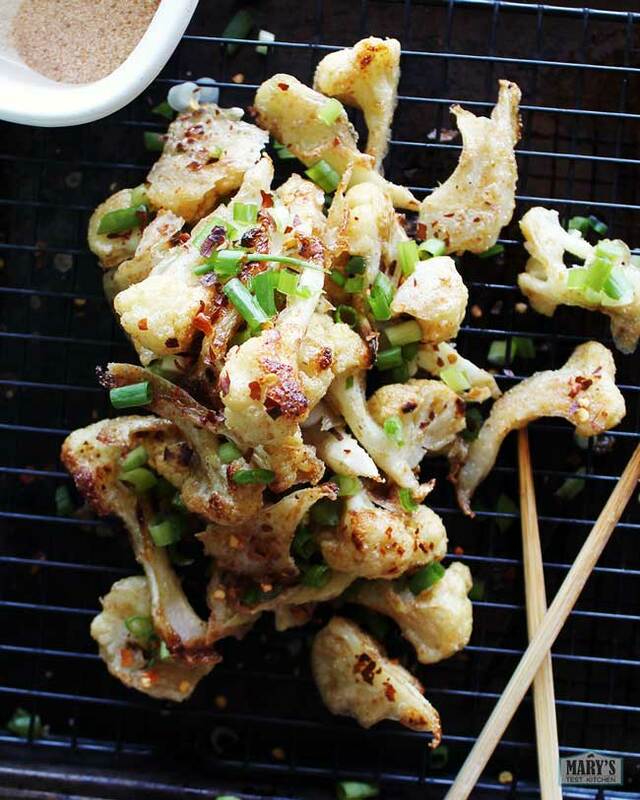 Made with cauliflower, they make a great salty snack or side to your Chinese take-out style dinner. The batter is super simple with just 3 ingredients and makes crispy wings whether baked or deep fried. Try it tonight! Start by preparing your cauliflower. For tips on how to cut up cauliflower simply and with the least amount of waste, watch the video above. You’ll need 400g (about 14oz) cut up into bite-sized pieces; about 1/3 of a large head of cauliflower. You can keep the leftovers in the fridge for a few days for more cauliflower wings or for adding to stir-fries later in the week. The cauliflower wing batter happens to be gluten-free. Mix water, ground flax seeds, and cornstarch together. It will be thin at first but will thicken as it sits. In the meantime, you can mix up the salt and pepper seasoning. When the batter has thickened, the texture will be goopy and similar to eggs. 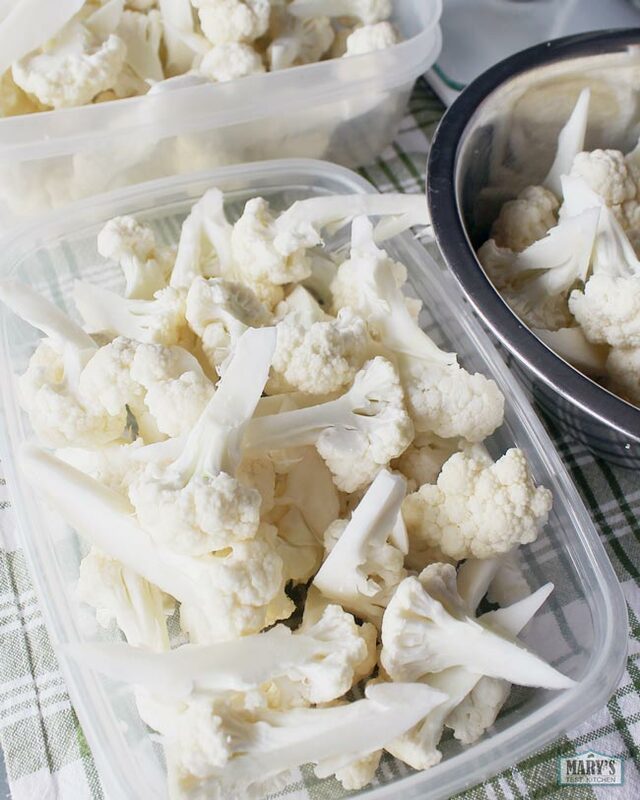 Add the cauliflower pieces and use clean hands to mix and ensure every piece of cauliflower is well coated. You can deep-fry the cauliflower wings for extra crispiness and flavour but these do well in the oven as well. 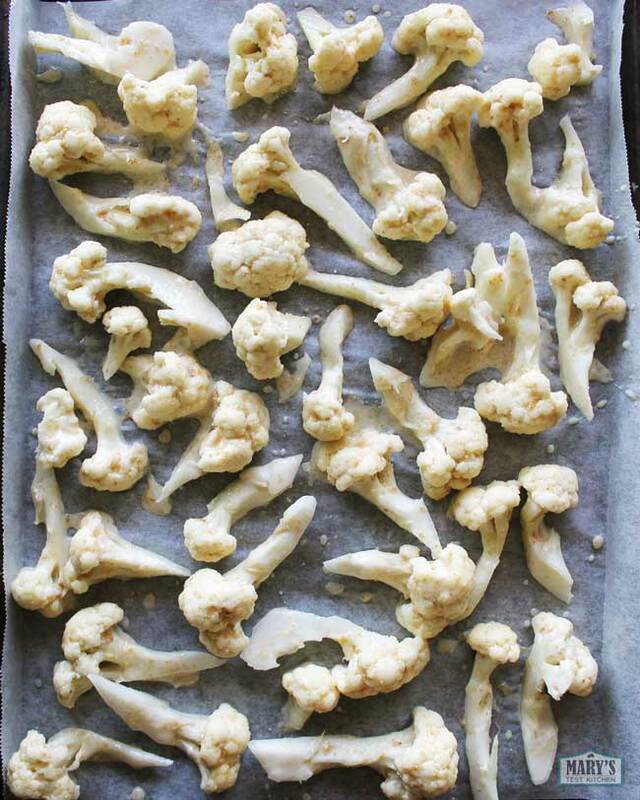 Lay the cauliflower out on a parchment-lined baking sheet. Bake in a preheated oven for 20 minutes. Remove the tray from the oven and spray or drizzle oil over the cauliflower before baking a second time for 20 minutes or until the vegan wings are golden brown. Toss in half the salt and pepper seasoning, taste and add more if desired. The cauliflower wings will be soft on the inside with a light crispy crust on the outside. For best results, serve them right away on a wire rack. A rack helps to prevent the wings from getting soggy from steam. Add chopped green onion and red pepper flakes for colour and extra texture and flavour. Enjoy! 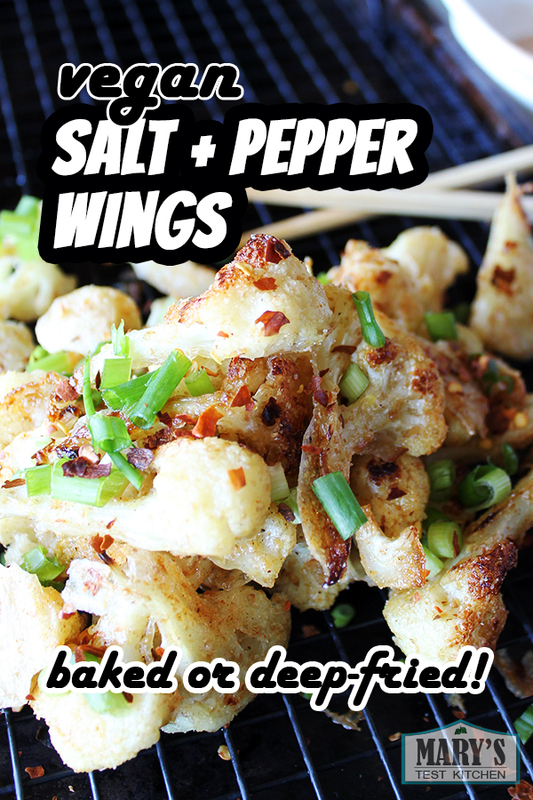 These Vegan Salt and Pepper Wings are made with cauliflower. They make a great salty snack or side to your Chinese take-out style dinner. 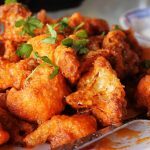 The batter is super simple with just 3 ingredients and makes crispy wings whether baked or deep fried. Try it tonight! Baked wings take about 40 minutes in the oven. Deep-frying takes about 15 minutes depending on the size of your pot. If baking, preheat oven to 425°F. After you have prepped your cauliflower, mix together the batter ingredients in a large bowl: water, cornstarch, ground flax seed and salt. Let sit for 10 minutes. Meanwhile, combine the Chinese salt and pepper seasoning separately. When the batter is thick and resembles the texture of eggs, add the cauliflower. Mix with clean hands so that every piece of cauliflower is well coated. You can now deep-fry or bake your vegan cauliflower wings. Lay the pieces out on a parchment lined baking sheet and bake at 425°F in your preheated oven. After 20 minutes, carefully flip each piece over. It's easiest to unstick the edge of each piece and then lift the whole piece; otherwise, the batter may come off. See the video for a demonstration. 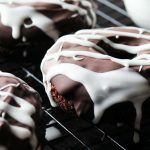 Spray or drizzle oil generously over each piece then bake again for 20 minutes or until they are golden brown. Heat 2 to 3 inches of oil in a pot or wok. Make sure the sides are high enough so there's no danger of overflowing when the oil starts to bubble. The oil is hot enough when you put a wooden spoon inside and bubbles form rapidly around it. Add the coated cauliflower with care so the oil does not splash. Do not crowd the pieces otherwise they may clump together. Flip occasionally. Remove when they turn golden brown. Let the pieces drain on a wire rack lined with paper towel to soak up excess oil. Add half the seasoning mix to the wings and toss well to coat. Taste and add more if desired. Garnish with green onions and red pepper flakes and enjoy right away! Tip: Use a wire rack to serve the vegan wings so they stay crispy.